 It has been sited in accordance with the manufacturers instructions and the ice cube maker is kept in your possession and returned in 'as new' condition, in its original packaging. We are so confident of the quality of our ice cube makers that we do not charge you for any extra warranty - it simply isn't necessary. None of the ice machines we sell are seconds or refurbished machines - every last one is brand new. We maintain the low prices we've become known for by buying in bulk. 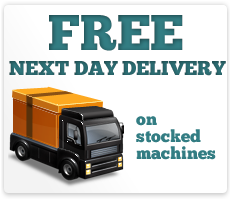 Because all our ice machines are ex stock, we don't have to add on any expensive extras.